This recipe is a favorite of visitors to New Mexico—in fact it is often voted the number 1 choice by tourists of our traditional dishes. This is the best sauce recipe—many are not very flavorful as they do not use a roux to develop the flavor. For Flat Enchiladas: Place a spoonful of green chile sauce on the plate, then top with a tortilla followed by sauce, cheese and onion. Repeat once more. Top each enchilada with more sauce, cheese and onion. Heat in a moderate 350 F oven until the cheese melts. Top each with a dollop of sour cream and a few grains of caribe. Encircle each enchilada with lettuce and tomato wedges. For Rolled Enchiladas: Dip the softened tortilla into the sauce and place a strip of each grated cheese and chopped onion down the center. Roll and top with more sauce and cheese. 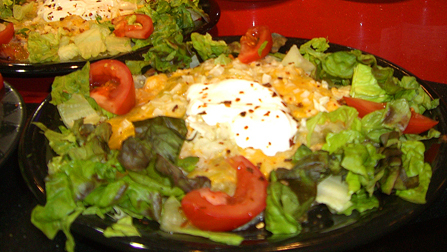 To serve a crowd, place the rolled enchiladas in a large, shallow baking dish, but do not cover with sauce. Just before serving, heat in a moderate 350 F oven. Warm the sauce separately and add just as you are ready to serve. Do not overcook or the enchiladas will be very mushy. Top with additional cheese and reheat until it melts. Add lettuce around edges before serving. This basic, yet versatile sauce without the chicken can be used to create enchiladas, or pour over chimichangas or burritos. Seafood, beef or beans can be substituted for the chicken. Melt the butter in a saucepan over medium heat. Sauté the onion until soft. Stir in the flour. Add the broth. Then add chiles, garlic, salt and comino. Simmer for about 10 minutes. Just before plating the enchiladas, add the chicken and simmer for another 2 mintues, leaving the broth rather thin.